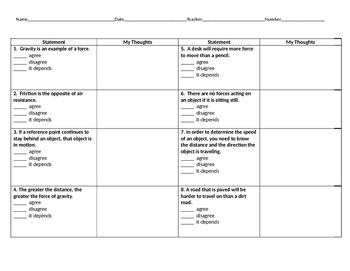 In this activity, students will read 8 statements about Forces and Motion and check whether they agree or disagree with the statement. 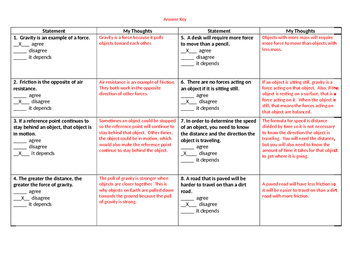 They will also include their thoughts beside each statement stating why they agree or disagree. This works great as a pre/post assessment. I have also used them as an independent assignment first and then allowed students to discuss their answers with partners. All of these statements are designed to create good discussions as a way to wrap up the main focus areas of the Forces and Motion unit.